Our generation has been dubbed the “Start-up generation”. About one-third of young Canadians want to start their own businesses, according to a recent McGill report. Entrepreneurs are an important part of our economy, not just here in Canada, but around the world. Entrepreneurial ventures literally generate new wealth. Existing businesses may remain confined to the scope of existing markets and may hit the glass ceiling in terms of income. New and improved offerings, products or technologies from entrepreneurs enable new markets to be developed and new wealth created. But for all the positive entrepreneurs bring to our economy, a lot of work goes into actually starting a business. When you first launch that business, it can be daunting, scary and exhilarating. While you grapple with so many emotions, it can be hard to learn when to say no to any work that comes your way. 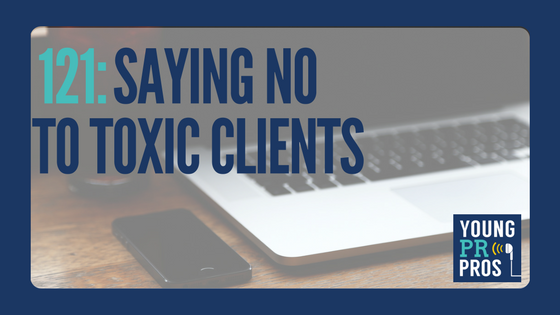 But it is important to remember that some clients can be toxic for your success. That is the topic of this episode. We list red flags you should look out for when meeting with prospective clients. A client is looking for free. Freelancer doesn’t mean free. Always charge something, even if it is building your portfolio. A client wants you to do ALL the work. As you grow your business, you will be hiring more people, or farm out some of the work to other entrepreneurs who have better expertise than you do. This also sets the expectations that you won’t drop everything (including family time) to run to them. A client belittles you and does more talking than listening. A meeting with a new client should be a dialogue, giving you the chance to ask questions. A client says “this will be easy for you”. There is a lack of understanding of PR/comms/marketing and indicates the client won’t want to pay for success. We got our inspiration from this episode from SpinSucks.com, a blog post dedicated to enhancing the reputation of the PR, communications and marketing industry. A recent article on the blog discussed things you never want to hear from a prospective clients, red flags you should look out for before saying yes to a job. As a young pro launching their new business it can be so hard to say no. But it is so important to set yourself up for success, not failure. This month’s Breakfast Club picks are all about mom lessons, a new podcast, a short week and getting connected! This entry was posted in Young PR Pros podcast and tagged career, career advice, client, clients, entrepreneurs, entrepreneurship, job, jobs, julia kent, kristine d'arbelles, professionals, ross simmonds, young pr pros, youngprpros by Kristine D'Arbelles. Bookmark the permalink.